In regions where there are a lot of stars (such as in the APOD of a Giant Molecular Cloud), or regions with bright emission nebulae (such as in the Hubblesite image of a Bok Globule), we can see dark nebulae that appear to be blocking the background light sources behind them. These dark nebulae are also interstellar clouds, but unlike the emission nebulae, they are very cold (10 K, as opposed to about 10,000 K for emission nebulae) and very dense. These clouds are called molecular clouds because the conditions in them are just right for the creation of molecular hydrogen. Be aware that two hydrogen atoms that have linked together form the molecule H2 (which is also pronounced "H-two", but should not be confused with HII). Another constituent of these dark clouds is interstellar dust. The dust particles are very tiny grains of different solids, and if you compare their chemical makeup to common materials on Earth, they are similar in many ways to soot and sand. As photons of light encounter a dark cloud of gas and dust, we observe two effects: first, the light is extinguished—that is, the background light sources appear dimmer than if there was no intervening cloud. This effect is referred to as interstellar extinction. The second effect is referred to as interstellar reddening. As the name suggests, the light from a background source will appear redder than if it had not passed through the cloud. As photons of light pass through the cloud, they get scattered from their original paths. Blue light scatters more than red light, so less blue light and more red light from the background object makes it through the cloud. 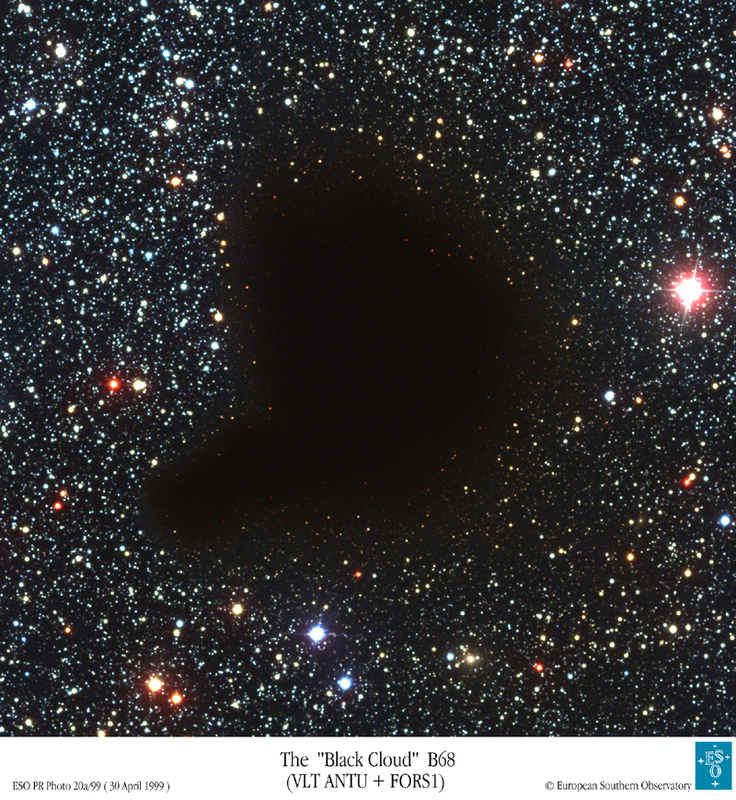 If you look closely at the APOD image of Barnard 68, you will see that all the stars visible near the edge of the cloud look red or orange, while those just outside the boundaries of the cloud look blue or white, which is caused by this reddening effect. Again because of the wavelength dependence of scattering by dust, most of the infrared light will actually pass through the cloud. See the image below of Barnard 68 taken through infrared filters. You can see the reddening, but you can also see right through the cloud! At Hubblesite, they have "image tours" that take you on in-depth studies of some of their more detailed images. You can tour the Eagle Nebula, the Orion Nebula, and the Carina Nebula (note, these links all use Adobe Flash). The Eagle Nebula image is one of the most famous Hubble images ever taken, and so, PBS has made a video on the making of the Eagle Nebula image.